Don’t Tippe-my-canoe, just enjoy floating the river! The jewel of Pulaski County is, almost inarguably, the Tippecanoe River, one of the top-10 most important freshwater systems in North America. It was given this designation by The Nature Conservancy in Rivers of Life: Critical Watersheds for Protecting Biodiversity and is looked at as the gold standard of streams for biological cleanliness by the Indiana Department of Natural Resources. 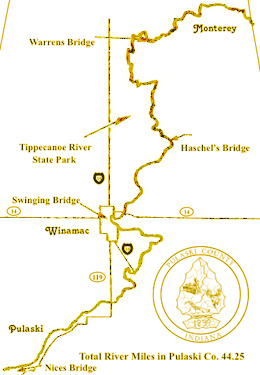 The Tippecanoe winds through the towns of Monterey and Winamac and has inspired many other designated recreational areas, including the Tippecanoe River State Park and a designated Canoe Trail. Of course, there are plenty of access points for slipping into the river with your own gear, including at the Tippecanoe River State Park, which even has a canoe camp!